The universities faculty of engineering is now linking to my blog! Follow the link above to have a look at some of the other summer projects going on at the uni. The graph shows the throughput of the wireless link before, while and after the interferer is running. The point is that it demonstrates that I now have the ability to subject my test wireless link the severe levels of interference – vital if I’m going to work out if the strategies I’ve come up with for making the glove link more reliable will actually make a difference in a high interference environment. The test setup basically works like this – in the anechoic chamber I’ve set up three routers and a WICED board. Two of the routers are set up as a pair to represent the link between the gloves and the access point. The third access point and the WICED board are working together to act as an interferer. I have set them on a particularly in-efficient “MCS mode”, which basically means that they use a lot of air time to transmit a small amount of data. This means I can very easily load the link to full capacity (about 4.6 Mbit/s). Because I have forced both links to use the same channel they will substantially interfere with each other. The graph above shows the throughput of the test wireless link. You can see that before I turn on the interferer it is able to do in the region of 45Mbit/s. All of a sudden the data rate drops when I turn on the interferer the data rate reduces dramatically to 5Mbit/s. The aim now is to make this dip less noticeable, or ideally eradicate it altogether. It’s been a bit of a while since my last post, so I thought it was high time I did another post about what I’ve been up to! First of all last week I had a very productive meeting with Dave and Gordon who work for Broadcom. They were able to give me loads of help with some of the issues I’d been having using the special firmware on the R6300s, but also some good advice about how to get the best out of the WICED boards. Spurred on my a successful meeting I’ve taken measurements for the maximum throughput rates for the R6300s over a wireless link, and also measuring the impact of alter the “transmit opportunities”. This is the period of time a wireless device is allowed to transmit before it must negotiate for the channel again. Adjusting this may allow us to make the system less susceptible to having its transmissions interrupted by devices in the audience. In order to get the amount of anechoic chamber time I need I’ve moved to a different chamber – it’s an older one which the department has which is less often used. It no longer has the equipment required equipment to take antenna measurements, but all I need is it too keep un-wanted wifi signals out and for that it’s fine! This is the Queen’s building chamber – usefully it has a removable floor which has allowed me to run cables out the chamber without keeping the door open. Part of the lack of posts recently has been due to the fact a lot of what I’m doing is taking throughput measurements and putting them in a spreadsheet – not very photogenic! Still, I’m currently planning how I’m going to do a final demonstration of all the different methods I’ve been looking at in terms of making wifi more robust, so watch this space. If anyone is coming to the UOB open day on Saturday (14th September) I will be doing some talks on the project and also about being an electronic engineering student at Bristol. I’m hoping I’ll get some video of these so I can put them up on the internet for people to see! Soo, after a lengthy battle with the R6300s last week (I ended up having to switch to a different unit because one of them was definitely acting up) I finally managed to get the results I wanted on Friday. I’m quite pleased with them, as I think they probably line up with more or less what was expected. One interesting piece of information I did discover that we didn’t previously realise was that the current generation of WICED boards only operate in the 2.4GHz band – so we weren’t able to take measurements in the 5GHz band as originally planned. This is a shame, as the 5GHz band tends to have less interference than the 2.4GHz band (as fewer devices use it). Having gotten the basic bench-mark tests for the WICED boards both in the ideal environment of the anechoic chamber and the more challenging environment of the lab It’s time to start playing with TX-Ops. I want to do either a more detailed blog post or a video about what TX-Ops are and how they fit into the wider storey about how wifi works, but to simplify what they allow us to do is adjust how long a device connected to an access point is allowed to transmit before another device can take its turn. By adjusting this we can effectively prioritise traffic from one source. That brings you band up to date with the project. Last week was quite hectic and difficult (as you could probably tell from my last post!) so I’m hoping for this week to go a little smoother and then maybe I’ll have a little time to do a video all about wifi. 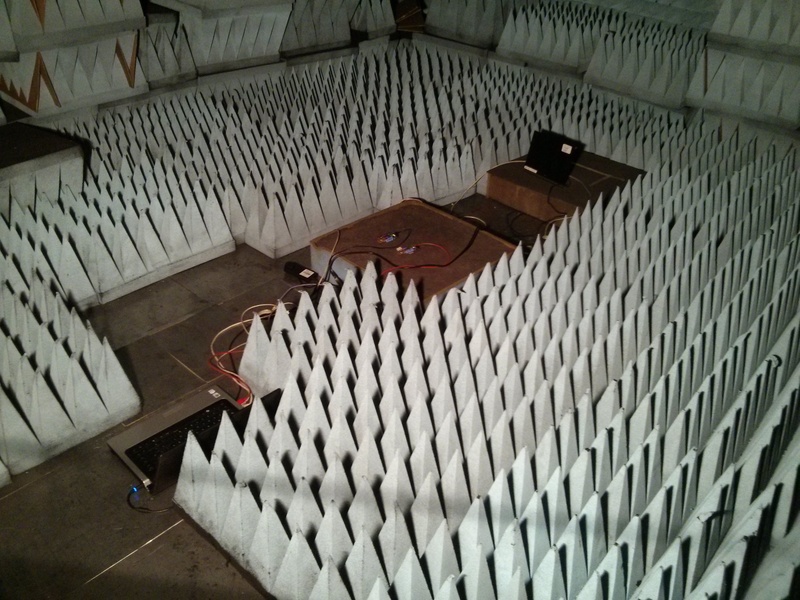 First video post – the anechoic chamber! At long last I’ve got round to putting together the long promised video of the anechoic chamber! Very keen to hear what people think- and if I should do more like it. Let me know!